For the last six years I have written of the annual letter of the Cuban Council of the High Priests of Ifá (Consejo Cubano De Sacerdotes Mayores De Ifá), the practitioners of traditional religion brought over from West Africa with the slave trade and now naturalized as a powerful indigenous religion throughout the Caribbean and growing in the United States. (e.g., 2017, 2016, 2015; 2014; 2013; 2012). 2018 marks the third year of an important change, in which many of the most important branches of the faith came together to produce a unified letter. 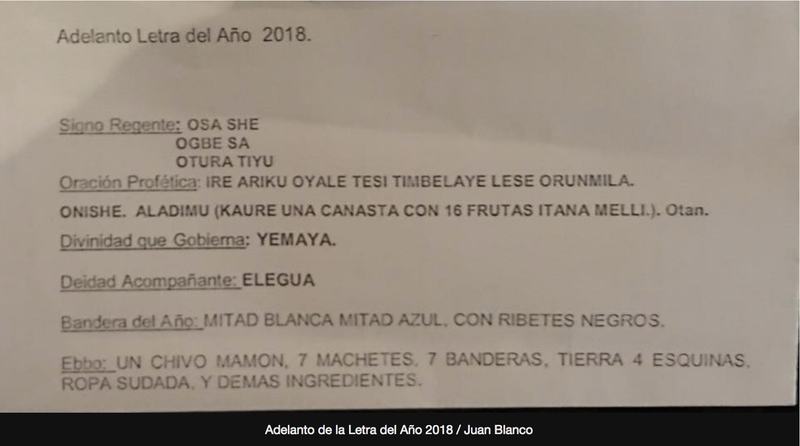 ("El documento, que copiamos íntegramente a continuación, incluye el signo y el orisha regentes, además de la oración profética. 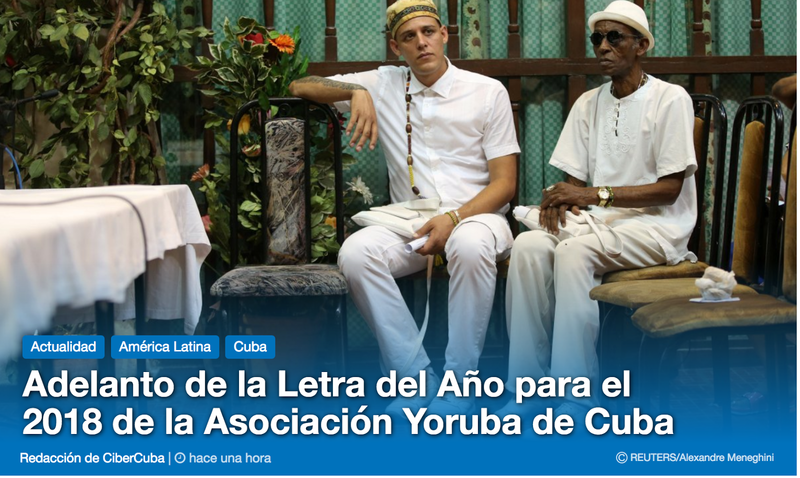 El documento se ha elaborado conjuntamente entre la Asociación Yoruba de Cuba y la Comisión Organizadora para la letra del Año Miguel Febles Padrón." (here)) The object of the annual letter is to provide guidance for the nation and its people. More specifically it is meant to provide guidance for faith practitioners otherwise unable to receive more specific guidance within their own branch. The Advance (Adelanto) Preliminary Letter for 2018 (also HERE) follows along with a brief reflection. It is the bare bones of the divination; the recommendations and more precise interpretations will follow. The full letter will be forwarded in the next several days. The divination for 2018 point to fairly significant ruptures and also to fairly significant disclosures in the sense that what was hidden will be revealed. The emphasis is on the crossroads--communication, movement, luck, and starts, true or false--and on symbols that has traditionally been gendered female--the sea, the moon, intuition, fecundity, and protectiveness of family. One might believe that the foretaste of this combination has already been much in evidence, especially relating to the revelations of long held secretes (open or otherwise) touching on the mistreatment of women by powerful men. It is likely that more revelations will follow this year. It is likely that those revelations will touch on abuses of power relationships and in the process of revelation, overturn them. The Oddu's speak to reversals of trust and of betrayals--of communication that cannot be trusted along with those who speak. But they also speak to broken peace then reconstituted--this is a period of breakdown and of reconstruction. And they suggest that these reconstitution are associated with secrets and their revelations, with the cycle of breaking down and building up, of which there will appear to be a lot this year. This will not be a tranquil year but a year in which the old ways--in virtually every aspect of life--will experience both decay and change. Not all of it will be positive for those affected as the true character of many who have operated in the shadows will more clearly be revealed. Osa-Se is here relevant--but perverse. In a year long context of revelations and of revolution on that basis, Osa-Se warns against false accusation. But these are false accusations built on a pattern of falsity, that of of the manipulation of revelation for other purposes. I would expect that this is a year in which data itself become corrupted--not that information is false, but perhaps falsely used. It will be the accusations that are false not the information on which it is made. This can apply to the conduct of institutions as well as of individuals ("A difa fun Owa. Owa nfi oju ole wo enikan tokose"). And it will require sacrifice as both revelation and the falsity of accusation will complicate communication ("won niki o wa rubo ki Esu ma baa tiilo dunrunmo eniyan kan saa ti ko see"). Ogbe-Sa amplifies the perversity of communication, revelation and disruption. It warns against deceit from friends (not enemies) and of the need to finish what is started. But the warning is for both the deceived and the deceiver--for the former who is to be sacrificed might by a presence of mind escape the consequences of deceit, while the deceiver might wind up the sacrifice herself. One is warned against the game player who invokes rules of play (in a game of death, of sacrifice) with which one is nor familiar but for which there is trust because the rules are said to be old. Here the story of the ram seeking to sacrifice Iki by playing a game of hiding inside a bowl reminds us that knowledge of deceit may come too late ("Emi ko mo pe're iku l'Agbo nba mi se"") but that in the end it is the deceiver who is deceived. 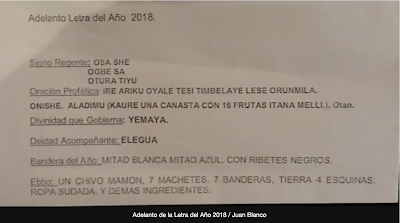 Otura-Tiyu (or rete or irete) points to the excess inherent in the use or misuse of talent but also of the growth of new from old. It speaks to preparation and moderation--to planning and preparedness. Yet that suggests that old is being swept aside, perhaps as a consequence of its inability to manage its tendency toward excess. It speaks to the regularity of the waves but also of their destructive effect on the land. It speaks to new solutions--it is a movement away from repetition and into unknown space. And the intimation is a warning about the consequences of the revelation-shocks that the year will bring--the consequences of which will be both unexpected and untimely. All of these warnings apply to states, to enterprises and to the relationships (power relationships) among people. It is focused on women--or the culturally female but suggests that female inter-relations are as subject to its general warnings as those in the dialectic among the culturally male and culturally female. The Oddu do not appear to be speaking as much to gendered wars (physically manifested) as to the manifestation of gender dynamics within relationships and the consequences of exposure, of deceit, and of the arrogance of power (which is not gendered at all). This is a period in which trust ought to be in shorter supply and in which things are made to appear in particular light for specific effect, and where ultimately those efforts will produce disaster and the overturning of power hierarchies in the face of talent and need. And especially there is an undertone here--it cautions about the reflex to admire the great and powerful for what they do, when their talents do little to meet the needs of those who power serves. It is a warning to the powerful that sometimes their efforts to impose a hierarchy of worth on the basis of size and power will undo them where talent and specific skills are needed. A further warning--power when used to cut and separate--to destroy--will produce nothing; it is only when the small and nimble are able to cobble the pieces together that something useful can be made.